POLL: Do you see venomous snakes in your yard? They've been slithering out from under rocks and other hiding places since early spring, and now is the time of year when snakes, humans and their pets can have dangerous encounters in the great outdoors. The best defense? Watch where you step, Tennessee Wildlife Resources Agency spokeswoman Mime Barnes said. "It's a nationwide campaign, 'Look before you step,'" Barnes said. "Snakes don't want to bite us. But they carry those wives' tales that circulate around them and they give people the willies. "People are fearful of them, but they really do a tremendous service for us," she said. "Venomous and nonvenomous snakes just play an incredible role in the environment." Authorities said they've seen a large number of snake bites in Georgia this year. Officials at the Georgia Poison Control Center had already seen 55 snake bites by May this year, according to The Associated Press. Dr. Gaylord Lopez of the poison control center said they saw their first snake bite call of 2017 during the first week in January, which is very early compared to most years. More than a third of their snake bite calls are copperhead bites. Of Tennessee's 32 snakes, only four are venomous. East Tennessee's venomous snakes are the copperhead and timber rattlesnake, two readily recognizable species if you know what to look for. In this area, venomous snakes' eyes have elliptical pupils and they have heat-sensing pits behind their nostrils. A rattlesnake has an obvious segmented rattle on its tail, and both species are equipped with long fangs that inject venom, according to the TWRA. "If you're unsure when you run across a snake, just step back slowly, take your time. Enjoy it but leave it alone," she said. Rattlesnakes and copperheads dine mostly on rodents, but like most snakes they will eat any small creature, including lizards, skinks and mice. Copperheads even eat cicadas, Barnes said. Homeowners, campers, hikers and anyone who works or plays outside should think about what attracts snakes. "If you have a brushy area around your home, just clear that area. Think about what you might be providing for a snake — shelter, food, water," she said. Even a dog's water or food bowl positioned low to the ground can attract thirsty snakes and other small animals that like to eat dog food. Bird feeders and other animal feeders offer rodents a source of food and thereby give snakes a ready menu, Barnes said. Other undesirable animals like to eat rodents, too. People should limit any materials that make snakes feel at home. "We often say with wildlife: shelter, water, food and a place to raise young," Barnes said of creating wild animal habitat. "And if you and your neighbors collectively are providing those things, then you are going to have that animal." Neighbors should work together to keep from providing snakes a place to live and food to eat, she said. All these measures will help protect pets, too. Most cats and dogs will try to catch and eat snakes, but a venomous snake can deliver a deadly blow of its own. The East Brainerd Animal Hospital suggests keeping pets indoors if you can and limiting outdoor attractors around the house. "We had a snake bite last week," said Mary Lou Riddle, animal hospital employee, on Friday. The veterinarians on duty were swamped and couldn't talk, but Riddle said they had just treated a dog for snake bite. "It was a black lab. But the dog is OK," Riddle said. "They think it was a juvenile copperhead that got him." Campers and hikers should remember that snakes are more active at night, so keep tents and sleeping bags zipped up, Barnes said. The same rules about keeping water and food out of reach apply when camping, too. Try to avoid snake havens like downed logs and brush piles. Snake repellents can offer some temporary protection, but snakes can become accustomed to smells. Killing snakes is illegal unless they are posing a direct danger, and moving them can kill them if they are relocated to an unfamiliar area. "Moving them's like a death sentence," Barnes said. If a homeowner catches a snake of any kind, it should be moved somewhere nearby so it recognizes it's still in its home territory, she said. Barnes, like other wildlife officers, has plenty of experience with snakes on the job, but she has even had a busy year at home, she said. "I move them off my own house all the time. I'm glad they're there, and I recognize that they're protecting my garden," she said. "We have black rat snakes crawling up our house now. My husband moved two yesterday," she said. "We have snake grabbers and we literally just move them across the driveway." Barnes said camping and hiking can make snake encounters much more likely because humans are on the snakes' turf. Make noise when walking, watch for logs, rock crevices and other hiding places where snakes might be waiting to ambush prey, she said. "Ninety-nine percent of the time they want to move in the opposite direction to us," Barnes said. "We just need to provide that time for them." 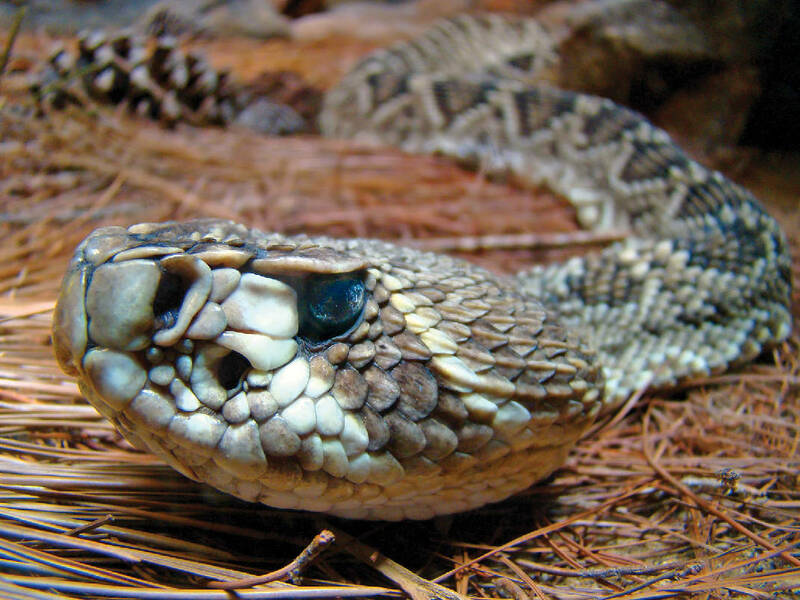 Wildlife biologists at Tennessee State University in Nashville are conducting research to determine the distribution of the pygmy rattlesnake in Tennessee. The species is listed as threatened and the research is intended to help efforts to preserve the species in the state. Though rare, the pygmy rattlesnake is typically found in West Tennessee but, as the study suggests, they could be on the move. Anyone who encounters this species is asked to document the location using GPS coordinates or detailed site description of where the snake was seen and report it. Photographs of the snake can be sent via email along with the location data to validate the correct identification of the snake. Previous pygmy rattlesnake sightings along with photographs can also be reported with precise location data and date of the sighting. Pictures taken with smartphones with the “Location Settings” option turned on can be used to validate the location of the snake. Do not harass or attempt to capture these venomous snakes. Report sightings to wildlife biologists Shawn Snyder at ssnyder1@my.tnstate.edu or by phone at 717-683-4226, or Dr. Bill Sutton at wsutton@tnstate.edu or by phone at 615-963-7787. Venomous snakes can be dangerous to farmers, foresters, landscapers, groundskeepers, gardeners, painters, roofers, pavers, construction workers, laborers, mechanics, and anyone who spends time outside, according to the National Institute for Occupational Safety and Health and the Centers for Disease Control and Prevention in Atlanta. Although rare, some people with a severe allergy to snake venom may be at risk of death if bitten. It has been estimated that 7,000 to 8,000 people per year are bitten by venomous snakes in the United States, and about five of those people die. The number of deaths would be much higher if people did not seek medical care. • Seek medical attention as soon as possible, call 911. • Try to remember the color and shape of the snake, which can help with treatment. • Keep still and calm to slow down the spread of venom. •Apply first aid if you cannot get to the hospital right away. • Lie or sit down with the bite below the level of the heart. • Wash the bite with soap and water. • Cover the bite with a clean, dry dressing.